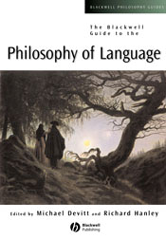 The Blackwell Guide to Philosophy of Language is a collection of new essays in a cutting-edge and wide-ranging field. Surveys central issues in contemporary philosophy of language while examining foundational topics. It provides pedagogical tools such as abstracts and suggestions for further readings. Topics addressed include: the nature of meaning, speech acts and pragmatics, figurative language, and naturalistic theories of reference.